#InnJoo ONE# Reviews collection - ONE - Inn Forum - Powered by InnJoo! Last edited by Carol on 2015-2-17 16:45 Hi everybody, since our new flagship smartphone--InnJoo ONE has been launched in Nigeria for several days, in order to provide us a full fair knowledge about this fabulous smartphone, we have collected some reviews made by professional reviewers in Nigeria as below, hope it would be helpful . Last year saw the introduction of two ultra cheap Android devices, from Dubai-based Innjoo Mobility, into the Nigerian market – the Innjoo i1s and Innjoo i2. They were instant hits, many thanks to the below 20k primce mark, which the company achieved by striking exclusive online-only deals with Jumia. Based on that success, Innjoo Mobility has decided to take the market even more seriously by officially launching a flagship for the first time ever in Nigeria. The Innjoo One is an Android KitKat 4.4 phone spotting a 13MP primary camera and 5MP front, with 2GB RAM, 16GB internal memory and a 1.4 GHz octa-core processor. Techpoint received a review unit ahead of the launch event on Wednesday. Here are my first impressions of the device. The Innjoo One is 6.9mm thin, weighs only 123 g and with its full metal body frame, has all the makings of a high end phone. In fact it looks like a bigger, slimmer version of the iPhone 5s, only it’s way cheaper. Apple fans will love this but it’s very alien to Android faithfuls like myself – the Innjoo UI has got no app drawer. You know, that very useful screen where you can view all your installed apps. It’s gone. Shortcuts are gone too.What you have instead is homescreens, app icons and folders. Yep, just like on the iPhone. Bear in mind these are app icons, not shortcuts so, pressing and holding actually unintsalls an app, rather than delete its shortcut from the homescreen. So if you are an app junkie, what you end up with is a complete mess of icons on your third homescreen. If you want any level of sanity, you have to utilize folders extensively. 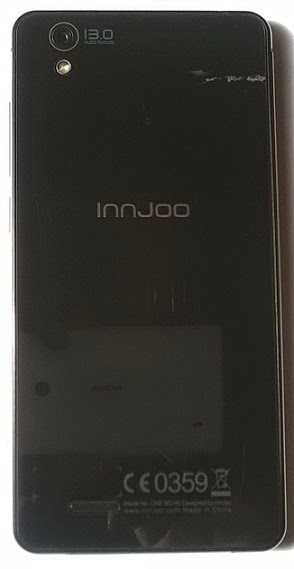 The Innjoo one comes with a non-removable battery so there’s no space at the back of the phone to insert SIMs. What you’ll find instead is two SIM tray entries to the side. But while one slot is designed to accommodate a single micro SIM, the second slot is designed to double as a nano SIM or memory card slot. Which means you have to make the choice between using only one Micro SIM and a memory card or two SIM cards and no memory card. I imagine this arrangement is unfavourable for space junkies who might want both dual SIM and expandable memory at the same time. 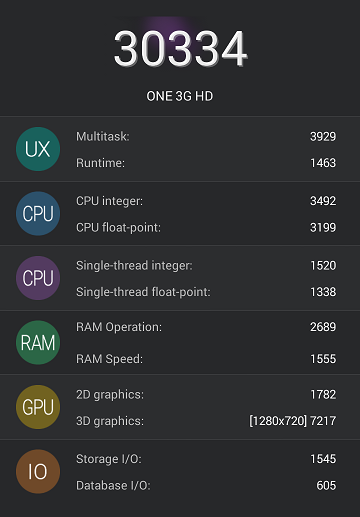 I mentioned earlier that the Innjoo One runs on a 1.4 GHz 8-core processor. I am yet to put those 8 cores to their full use because I’ve basically been running on ‘CPU power saving mode’ since I got the device. But that hasn’t stopped me from playing Spiderman Unlimited and Hitman Go totally free of lag. And it works. I managed to get 6 hours of intensive (mobile data on, about an hour of gaming with sound, lots of downloading and over 30 minutes GPS navigating) use out the small 2600 mAh before it dropped to 10%. 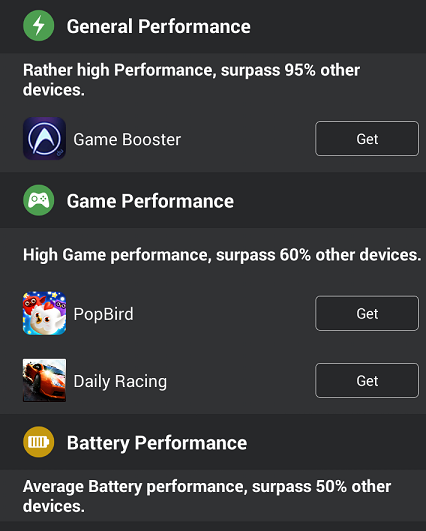 Considering I’m not much of a gamer, I can already tell I will be using the phone permanently in CPU saving mode. HyTech2015 + 25 I like it. SAAA + 5 I like it. Whoooooop, so great. Hope you could enjoy InnJoo ONE when you buy it. When are u launching it in UAE???? 4peace + 5 I agree. Editor’s Note: Fastest growing mobile phone brand in Nigeria, InnJoo is launching its latest smartphone, the InnJoo One later this week, and we’ve already got our hands-on with the device. 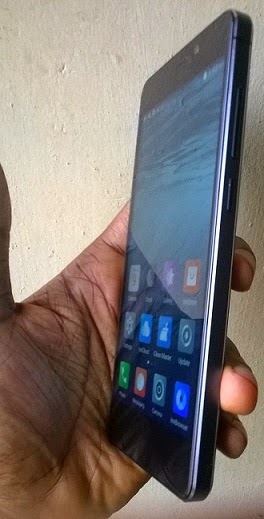 In Jesse Oguntimehin’s first impressions review of the InnJoo One, which originally appeared on Gearloy, our gadget-focused blog, he describes it as a ‘pretty’ and ‘premium’ device. 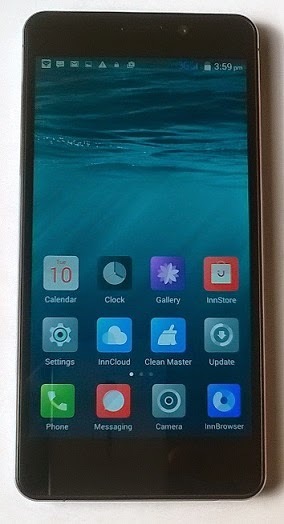 Firstly, I like the simple new naming convention, unlike the InnJoo i1s and 12. From the name of the phone, to the packaging and the design, I sense some familiarity, though. 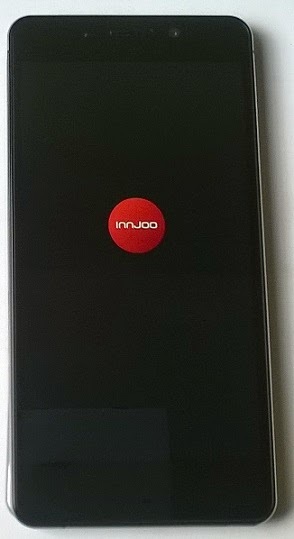 The InnJoo One bears a resemblance with the iPhone 5/5s. It uses dual SIM, with the second SIM option supporting TF Card (another name for microSD card) or a nano SIM card. Looking at the phone from a distance also reminds me of the Huawei Ascend P7. Everyone seems to be copying each other these days. The InnJoo One has a customised Android KitKat 4.4.2 with a lot of app pre-installed. The unit I am having with me was sent by Jumia Nigeria and has the Jumia app pre-installed too. Other apps that are pre-installed are: InnJoo InnStore, InnCloud, InnTheme, InnBrowser, Google Apps (Maps, Search, Voice Search, Google Plus and the like), Facebook, Skype, WhatsApp, YouTube, Go keyboard and a host of other apps that they figured folks would love to use. The lock screen looks pretty out of the box. The phone did not take long to charge from 80% to 100%. I’m thinking the phone charges pretty fast and its non removable battery will be able to take a full day on a single charge. I am going to test it out to see this for the full review. Everything about the phone is pretty. Typing on the phone feels premium as well. 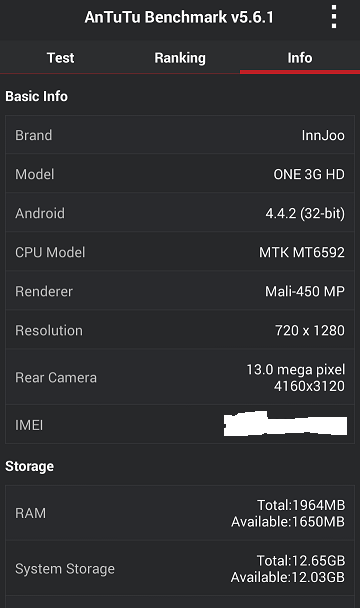 I do not know how much InnJoo is going to sell this phone. But by the quality I am interacting with right here, I would say N40,000. That’s me just wild guessing. I’d pay N40,000 for this phone as it is. It spots an Octa-Core processor with 64-bit architecture and 150 Mbps speed capable of LTE connection, 2 GB of RAM, 16 GB ROM (but expandable via microSD card), 5.0” HD IPS screen and a 13 MP back camera with flash. The UI of the phone is based on the customised InnOS. This is just a first impression, but I have a lot to say about the phone already. I am just going to leave it here and you can wait for a full review from me soon. Hint: The battery is good (charges pretty fast from 0% to 50% under 35 mins and does not lose charge pretty fast. More on that in my full review to be published later this week. sethi + 10 I like it. Innjoo as you already know is one of the brands that dominated the mobile market the previous year with the introduction of extremely affordable but powerful smart devices. The fast rising mobile brand has again surprised the computing world with the introduction of one of the most powerful smartphones this year, the Innjoo ONE. A smart device that is packed with a whole lot of mind-boggling features and is totally designed to offer the very best. Innjoo One which is one of the best smartphones from Innjoo was released on 11th February, 2015 and now available at Jumia. It will be notable for its powerful octa-core processor, sharp 5.0 inch display, brilliant 13 megapixel (rear) / 5 megapixel (front) cameras and super-fast 4G connectivity (3G model in Nigeria). Innjoo one is a 5 inch HD display smartphone, incredibly slim at just 6.9mm and very light weighing 123 grams. The body is made of crafted metal frame and glass shield, giving it a beautiful and premium look. 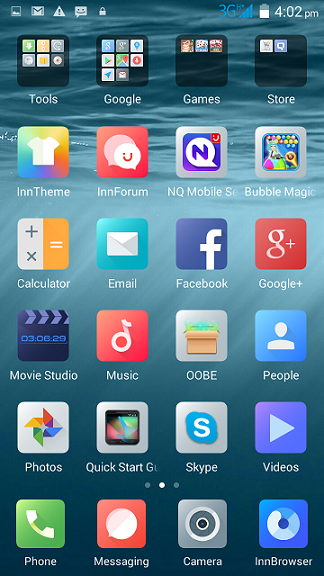 The overall design of Innjoo One can be summarized in three words; “Neat, Simply, Classic”. Display And CameraWhatever you aim to do with the Innjoo One (watch videos, browse the web and so on), the 5.0 inch IPS display with 1280 X 720 pixels resolution is certainly wide and brilliant enough. Also at 294ppi pixel density the viewing angles will be perfect. Looking at the camera which is an astonishing feature in Innjoo One, you have a 13MP back camera with F2.0 high aperture which will no doubt take amazing pictures; it’s the perfect smartphone to capture all the fun moments. Are you a selfie lover? You’re definitely going to fall in love with this device. It offers an enhanced 5MP front-camera with 88º wide angle lens which won’t only perform excellently well in low or high light but will as well cover more people in your selfie shot, it also features HD video recording, face beauty mode and selfie to improve user experience. Innjoo ONE – PerformanceA fast and smooth performance is what you’ll expect from this smartphone and high-end applications will sure run perfectly. It comes packed with a powerful 1.4GHz MTK Octa-core processor coupled with 2GB RAM which are rare features on smartphones today. Innjoo One runs Android v4.4 kitkat and provides enough storage space; 16GB built-in (ROM) which is expandable up to 64GB via microSD. The battery capacity is clocked at 2600mAh, that’s powerful enough. To ensure the battery last longer and you spend ample exploring the phone, it features intelligent power saving module which will enable you turn-off and wake-up apps automatically by detecting your operation. Internet And ConnectivityThe phone features Dual SIM and is in LTE & 3G model, though only the 3G model is made available in Nigeria. For connectivity it supports WiFi which can be used as WiFi hotspot, it’s Bluetooth and USB enabled as well. Innjoo One was launched on Wednesday, February 11, 2015 with preorder starting on Feb 12 exclusively on Jumia. We got an advance unit of the Innjoo One 3G HD from Jumia and have been playing around with it for a day and a couple of hours and will be sharing our first impression review here. Innjoo One is available in both LTE and 3G models, but the 3G model is the one that will be available in Nigeria. The Innjoo One is so far the best design from Innjoo with a premium look and feel, but will not set you back so much in terms of cost. The DesignInnjoo One is a gorgeous smartphone. There is no cheap plastic to report. Its body is crafted with a metal frame with tough Dragontrail Glass covering the front and the back. When you first pickup the Innjoo One, you can not but notice its super light weight and super slim design. The One weighs just 123 g, which is like shaving off a full 42 g off the Innjoo i2s. It is also lighter and slimmer than the Infinix Zero, which weighs 156 g.
The design of the Innjoo One with its rounded corners sort of reminds me of the iPhone 5S, though the One is bigger and slimmer. However, that is where the similarity ends as the Innjoo One takes its own design with a glass on metal finishing. The 5-inch display sits very comfortably in front of the phone. The bezel is slim, making the display the star attraction in the front. Below the display are the three capacitive touch buttons for navigation, which are not visible until you press them while the phone is unlocked. Above the screen is the 8 megapixels camera and the earpiece. On the left side is the two SIM slots. The SIM 1 slot supports micro SIM, while the SIM 2 slot supports the smaller Nano SIM. SIM 2 slot also doubles as a microSD slot and can take up to 64GB memory card. The implication is that if you must add a memory card, you will have to sacrifice the second SIM slot. Two physical buttons sits on the right side, the first button is for volume control, while the lower and smaller button is the power button for turning on, turning off, or unlocking the phone. The back of the Innjoo One is covered in glass with Innjoo written around the middle. On the top left corner is the 13 megapixels camera and LED Flash. The loudspeaker is on the lower left corner. The back is non-removable, so the battery cannot be replaced. The 3.5mm jack is located on top, while the microUSB port and the mouthpiece are positioned on the bottom side. The Innjoo One is comfortable to hold. Though the back is covered with glass, the design is in such a way that your hand is never really in contact with the back, but the metallic sides, which gives a very good grip. Innjoo One features a brilliant 5-inch IPS display with 720 x 1280 pixels resolution. The display is bright with no pixellation in site. The colour reproduction is also accurate. The display offers auto brightness feature that alters the brightness of the screen depending on the lighting in your surrounding. So that whether indoors or outdoors, the display shines through. The CameraInnjoo One sports a 13 megapixels rear camera and an 8 megapixels front facing camera. Both cameras can record 1080p HD video. The 8 megapixels front camera will be great for taking selfies or for taking wefies with your friends. It will also be great for making video calls on Skype. The 13 megapixels rear camera offers great shots with great colour accuracy. The camera on the Innjoo One also features HDR, voice capture, face detection, smile shot, and of course LED flash. There are a couple of included software to enable you retouch your photos before sharing. The PerformanceInnjoo One is built for high performance. It features a 1.7GHz octa-core processor with 2GB of RAM. Though it features 8-cores, all cores are not 'On' all the time, the phone uses the right amount of cores to efficiently handle the job(s) at hand. This makes the Innjoo One power efficient and probably why the phone does not heat up so much. 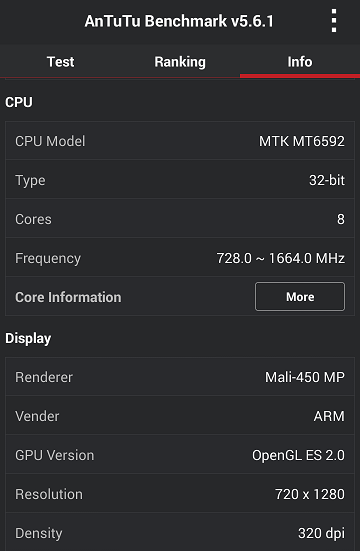 Our early specs of the smartphone claimed the chipset was built on a 64-bit architecture, however this is not the case as our test shows it is actually a 32-bit chipset, the Mediatek MT6592. It seems the chipset with 64-bit architecture will be limited to the LTE models, which will not be sold on Nigeria. The Innjoo One 3G HD (the model for Nigeria) offers 32-bit architecture. Whether 32-bit or 64-bit the Innjoo One is a super performer. We ran the AnTuTu Benchmark and our Innjoo One scored high. In the performance explanation, the Innjoo One performed better than 95% of devices (very impressive). This means that the Innjoo One is among the top 5 percent of smartphones in the world according to AnTuTu Benchmark (in general performance). Innjoo One also did well in game performance and battery performance, ranking better than 60% of smartphones and 50% of smartphones respectively. 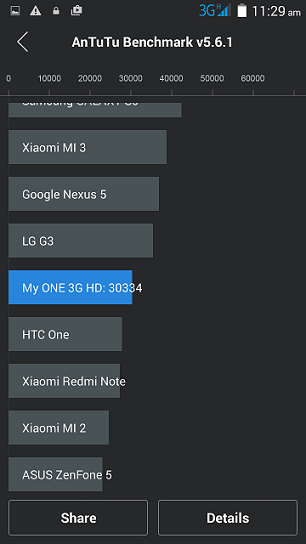 Overall, the Innjoo One scored 30334 on the AnTuTu Benchmark, which places it ahead of the first generation HTC One (i.e. the M7) and a couple of thousand points behind the LG G3 and the Nexus 5. I think this score is impressive considering that the Innjoo One will cost just 27,999 Naira. The true test of performance is in its actual use. The Innjoo One performance very smoothly with no lags. It also does not get hot unnecessarily. The battery performance is okay and can go for 24 hours without requiring recharging. But, of course battery life depends on what you do with your phone. 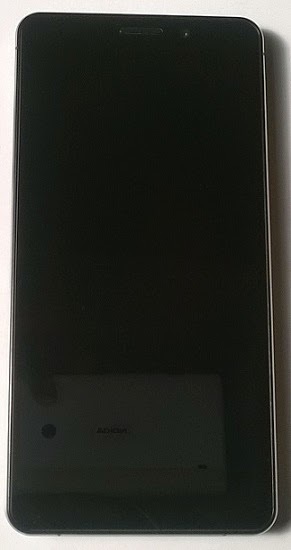 Innjoo One runs on Android 4.4.2 (KitKat). 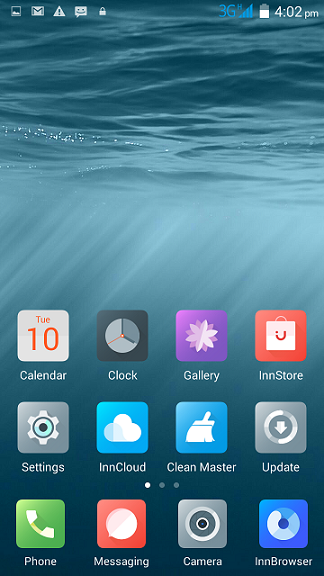 However, it is not stock Android, because like other mobile brands, Innjoo offers its own UI skin called the InnOS. The interface is minimalist and clean, which is good as you do not need to go back to school to learn how to use the phone. The interface is intuitive, so operating the Innjoo One will be easy. To unlock the phone you press the power button and swipe the lower left corner of the screen from left to right. You can also enable 'double tap to unlock' feature in settings if you prefer that. 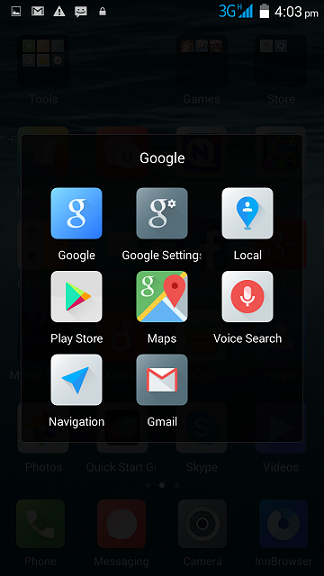 Once on the Home screen you can swap left or right to see available apps. The InnOS UI puts Innjoo apps front and centre, Apps like the InnBrowser, InnStore, InnCloud, and the InnTheme are given prominence with Google Apps like the Google Play Store, GMail, Voice Search, etc, lumped up as a collection. Innjoo supports the Google Play Store, so you can download and install anyone of the millions of apps at the store. You can also move apps around. Just press and hold the icon and move it to any location you want. Pressing the middle capacitive button (Home button) takes you to the Home Screen. Press and hold the button if you want to see recently opened apps and swipe it if you want the current app to close. The left capacitive touch button (Menu button) gives you options available for a given app. For example, when on the browser pressing the button will reveal options like New Tab, Bookmarks, History, etc. The right capacitive button is the back key. Innjoo One comes with Google+, Skype, Facebook, Google Play Store, Gmail, Whatsapp, YouTube, Jumia Store, and a couple of other apps. There is also a Movie Studio app for creating great videos. CommunicationsThe Innjoo One offers crystal clear sound for making calls. Browsing is also great. Innjoo One comes with the InnBrowser, which is great. I also downloaded the the Google Chrome Browser and the Firefox Browser from the Google Play Store and browsing was smooth and fast on both. Innjoo One 3G HD offers HSPA+ radio, which should give it download speed of up to 42.2 Mbps. Downloading the browsers mentioned above took seconds rather than minutes. So, Innjoo One will offer seamless video streaming and downloads. If you live in a country where the LTE models are on sale, you will even enjoy greater speeds. Innjoo One offers a mobile hotspot feature. I was able to successfully connect my laptop and mobile devices to the hotspot. The good news was that the phone did not heat up and the battery was not depleting that much while running as a mobile hotspot. ConclusionThe Innjoo One is by far the best smartphone from Innjoo. Its super light weight, slim frame and glass on metal finish gives it a premium look and feel. Combine this with the fact that the Innjoo One ranks among the top 5% smartphone in our performance test, but will cost just 27,999 Naira and you will understand why we have to declare the Innjoo One as the best value for money smartphone in Nigeria. The requirement of sacrificing the second SIM if you want to expand your memory and the non-removable battery may ruffle some feathers, but by and large the Innjoo One is an impressive smartphone. The Innjoo One 3G HD as it is rightly named is not just like any other smartphones out there,the device is just One More Surprise from the Innjoo phone makers.It is the first smartphones from the Innjoo ONE series and comes with full metal frame.Innjoo ONE is beautifully crafted with a 5-inch HD IPS screen and a brilliant dragon trail glass on metal finish. Innjoo one 3G HD smartphone stands out of the crowd with its amazing features and its elegant and sleek design.One phone that really comes to mind at the sight of the Innjoo ONE is the best selling infinix zero from Infinix mobile,but the innjoo ONE is slimmer compare to the infinix zero. The innjoo ONE harbors much higher mid range specs and is targeted at those who seek high performance while conserving power and its highly efficient battery ensures long use. Unboxing/Hardware and Design:What we have in the sales pack is the phone itself, a Tiny pin for SIM tray, USB cable and plug, as well as headphones and users manual. The packaging is really lovely and not different from the Innjoo red and white colors. 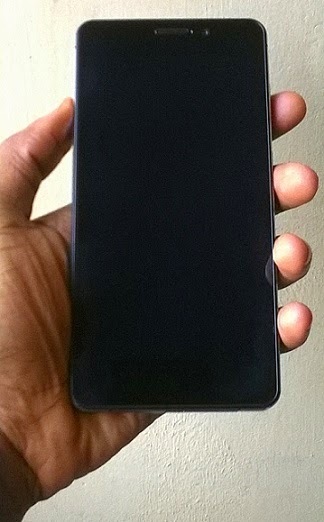 Unlike other innjoo smartphone ,the innjoo one is made of metal frame and a glass finishing.One thing i love so much about the device is its weight .At 123g,the innjoo one feel so light and slim.The device is slimmer and lighter than its closest rival,the infinix zero which weigh a massive 156g.The innjoo one adopts rounded corners design giving the device the look of an iPhone 5s. The 5 inch display is the most prominent thing you get to see at the front of the device,but above it is a 5MP camera and the earpiece,you also have three onscreen capacitive touch button which only becomes visible when the phone is unlocked . Innjoo ONE DisplayThe innjoo ONE is a handy device offering a 5-inch 1,280 x 720 IPS HD display, rendering a 294 pixels per inch (PPI).Images/text/ color reproduction is as close to reality as possible both in doors and out door . The innjoo ONE rocks a 64-bit Octa-core MediaTek MT6752 processor clocked at 1.4GHz.The processor backed by the 2GB RAM should handle all your daily needs without lagging behind,You will recall that the infinix zero sports the same 1.4GHz octacore processor.For the innjoo One,a 64-bit architecture with 2GB RAM mean a smooth and faster performance. Internal Memory and Memory CardONE comes with an expandable 16GB internal memory.The memory is expandable via micro-SD card slot that supports up to 64GB. So if you feel 16GB memory wont be OK for you, you can always bump up the memory via micro-SD. Innjoo ONE SIM card and NetworkInnjoo ONE is a dual SIM/standby enabled smartphone which means that two SIM cards can be used on the device and both SIM card will be active simultaneously. The ONE both 2G and the faster 3G networks.The two SIM slots/tray/micro SD tray all all located at the left hand side of the device.The SIM tray is not like every other SIM slot,hence,the device comes with a PIN for ejecting the SIM trays. Innjoo ONE CameraChiefly in charge of the innjoo ONE photography is a 13MP auto-focus camera with f/2.0 aperture and a 5MP front facing camera with 88-degree viewing angle .The camera is enhanced to perform well in low and high light.Features like continuous mode,HD recording and face beauty mode are also in place. Innjoo ONE BatteryThe innjoo ONE is fueled by a 2600mAh polymer battery.The battery lasted up to 18 hours after initial charge -not up to 90% charged.When fully charged,the battery will surely last more than a day of rugged use (Watch out for the Innjoo ONE battery review) disappointingly ,the innjoo one battery is non removable. The innjoo one runs on Android 4.4 Kitkat OS on top a home grown InnOS . Pre-Installed AppsThe innjoo ONE 3G HD comes with InnStore full of latest applications and games, InnCloud which offers you unlimited storage space and super fast InnBrowser which gives you access to all websites.Innforum app, and inntheme are also on board. The Innjoo One is a solid device with a very eye catching design.It runs smoothly and perform all task without without lagging.It unfortunately comes with a non removable back cover/battery.And also you may have to do without the SIM 2 if you must expand your phone’s memory.Overall the phone deserves a thumbs up. Last edited by SAAA on 2015-2-17 17:36 These are such great reviews & really helpful for anyone to purchase this One Innjoo model (3G-32Bit) . But rather i'd be more interested in the 4g 64 bt model os Innjoo One, personal preference.